ROME (ITALY), Thursday, October 18, 2018 (MERCURPRESS.COM) - "Many things unite our peoples, who are among those of ancient maritime, commercial, cultural and religious civilization, think of Augustine, who wrote The City of God after the Sack of Rome in 410, a berber philosopher saved Western culture, defining a new mission and Rome had a role, it was not the end of the world, as someone believed at the time in Europe, but there came to say a great theologian, who was Phoenician and certainly did not like Rome very much earlier, despite having Roman citizenship, the old ruler of the Mediterranean, owner of the Mare Nostrum.". 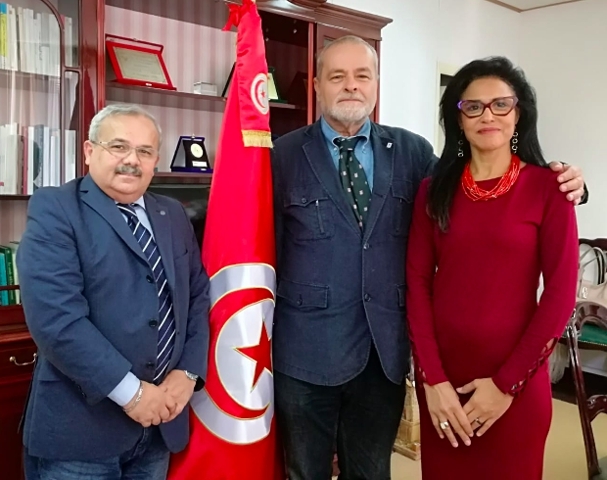 So Paolo Pantani, President Emeritus Acli Cultural Heritage and member of the Organizing Committee of the Assembly of the Mediterranean Macroregion, in his note of reply to the letter of the Consul General of the Republic of Tunisia in Naples Beya Ben Abdelbaki Fraoua. "We will make our best - continues Pantani - so that the Assembly of the Mediterranean Macroregion to be held in Naples at the 'Italian Institute for Philosophical Studies' on next November 9th, will represent a founding moment. Our ancient lands need territorial cohesion, the European Treaty of Lisbon officially entered into force on December 1st, 2009, promotes this action, we are 10 years behind." "Thanks to all of you - concludes Pantani - for the great reception of our communications, from today begins a new phase."